HDM's installation team have successful installed just about every type of steel requirement possible due to the diversity of the items we fabricate. Making use of our experienced and qualified installation team, HDM can work effectively in all types of environments from quite residential properties to busy construction sites or commercial properties. Our policy to always maintain the highest level of safety during an installation has made us highly regarded within the building trade and has led us to become approved contractors for many large companies. 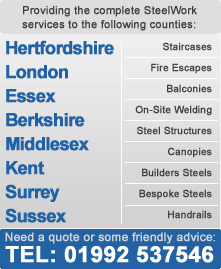 Our philosophy for creating the best possible method for a steel installation starts at the very beginning of a project whether its a large structure, a steel staircase or a just small set of railings. Designing the item into manageable components that we can fabricate and test in our large workshop by bolting or tack welding the item together allows us to then be confident of a smooth and hassle free install, this helps our clients to continue with any further works with minimal disruption.